Time-pressed, foodie and health-focused consumers are constantly looking for ways to get the produce they want and need, when they want and need it. We see the produce industry — and disruptors — adjusting to, adapting and pushing these trends. It does this by providing locally sourced product, adopting traceability protocols and implementing new scanning and delivery technologies at the retail stage. Consumer demand is high for food fitting into a specific niche or diet, such as local, organic, vegetarian, vegan, paleo and peanut-free. Gluten-free is one example of a food trend of the diet-conscious consumer. In 2016, Jama Internal Medicine published an article, based on research performed between 2009 and 2014, that showed more people are embracing gluten-free diets, although the presence of celiac disease has remained steady over that same timeframe. It’s hard to talk about the personalization of produce without mentioning Amazon, which purchased Whole Foods in 2017. The retail giant’s grocery delivery service, AmazonFresh, sells perishable and nonperishable products to customers in select U.S. states and certain cities worldwide, accommodating the time constraints of busy consumers. In March 2018, Walmart announced it would begin offering its own delivery service called Walmart Grocery Delivery, which it plans to make available to more than 40 percent of U.S. households by the end of the year. With this in mind, we kept a watchful eye on consumer markets as we compiled this year’s 2018 State of the Industry Report. We’ve also provided you with the latest statistics about commercial production space, growing systems, pests and diseases and more. Do you have an anecdote about how your produce operation is adjusting to changing consumer demands? Drop us a line at pwilliams@gie.net to keep us up to date. The data on these pages was collected via an online survey from July 30 to August 11, 2018. The survey was closed for tabulation with 224 responses. To best represent the audience of interest, the results in the report were based on the 115 respondents who indicated that they work for an operation that grows finished produce and/or edible crop transplants under cover. The response was tabulated and a report was prepared by Produce Grower’s editorial staff in accordance with accepted research standards and practices. More of this year’s survey respondents are opting for large footprints of 50,000 square feet or more. 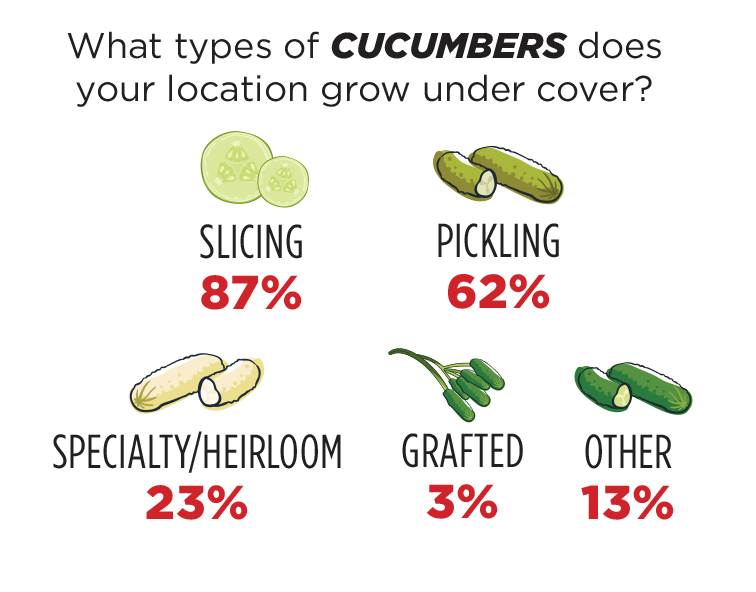 This indicates that growers are willing to take bigger and bolder moves when it comes to expanding production space. Switches from large vining, fruiting crops to more lettuces and leafy greens reflect a change to produce that is a cornerstone of various trendy diets. What’s more, lettuce and leafy greens have a shorter turnaround and earlier harvest time than tomatoes, cucumbers and peppers, so growers can more frequently sell these crops to retailers and consumers who constantly demand local and fresh product. Meanwhile, there has been a decline in the number of common greenhouse fruiting crops being grown — tomatoes, cucumbers and eggplants. Compared to last year’s numbers, the number of grower respondents who produce these crops decreased by 19%, 23% and 21%, respectively. Similarly, hot peppers dropped 25% from last year, and sweet/bell peppers (formerly listed as just “sweet peppers”) fell 27%. Direct-to-consumer sales of finished produce increased 4%, sales of finished produce to grocery food store retailers increased 14% and sales of finished produce to mass merchants increased 6%, from 2017. These increases, along with an 18% increase in the sale of finished produce to restaurants, suggest shifts in catering to more customers’ individual wants and needs and to the types of retailers that respond to those preferences via personalized offerings. A sizable percentage of grower respondents (26%) said they do not have transplant customers. Meanwhile, edible crop transplant direct-to-consumer sales decreased 8% from last year. It is possible that more end-consumers would rather purchase finished produce than grow their own. Sales of both edible crop transplants and finished produce to independent garden centers have remained steady over the past year. In 2012, edibles accounted for 27% of increases in sales at garden centers, but in 2017, that number dropped to 8% as sales of succulents grew, according to sister publication Garden Center magazine’s 2017 State of the Industry Report. However, this could reflect an increased demand for trendy ornamental crops at IGCs just as much as it could be a decreased demand for produce.